Why surplus Soviet military equipment is still used in the U.S. Expert: "The difference between the two types is that the F/A-18 has a folding wing and vertical twin stabilizers: The Su-34's stabilizers are parallel." Photo: Sukhoi Su-27 fighter aircraft. A U.S. Air Force (USAF) fighter jet has been reportedly spotted practicing close aerial combat against a Russian Sukhoi Su-27 over Nevada. The eyewitness may have got the aircraft type wrong, but there actually are Su-27s in the U.S., as well as other unofficially procured examples of Soviet military equipment. A "Russian Su-27P" has been involved in an air combat training exercise with a USAF F-16 in the skies over Nevada, The Daily Mail claims, citing a local eyewitness. The amateur photographer took photos of the event on Nov. 8, 2016. He insists that the F-16's opponent was a Russian-built single-seat fighter jet. The British newspaper believes it is one of the several Su-27s purchased in the former Soviet Union. The close aerial combat, or dogfight as the tactic is known, took place at an altitude of 6,000 meters. "It is universally believed that now, with precision missile weapons in place, there is no longer any need to engage in dogfights, because the adversary can be safely engaged from a distance," Dmitry Safonov, a military analyst with Russian daily newspaper Izvestia, told RBTH. "However, close aerial combat allows pilots to hone their skills, as well as testing the capabilities of their own aircraft and those of the simulated opponent." Safonov said the U.S. had indeed purchased some Russian military equipment from former Soviet regions. In 1997, Washington procured 21 MiG-29 fighters from Moldova, to prevent them falling into the hands of the Iranians. Several Su-27s were bought from Belarus and Ukraine between the mid 1990s-2000s for aggressor roles as part of USAF pilot training. "All these aircraft were purchased unofficially to be subsequently studied by American experts," Safonov explained. 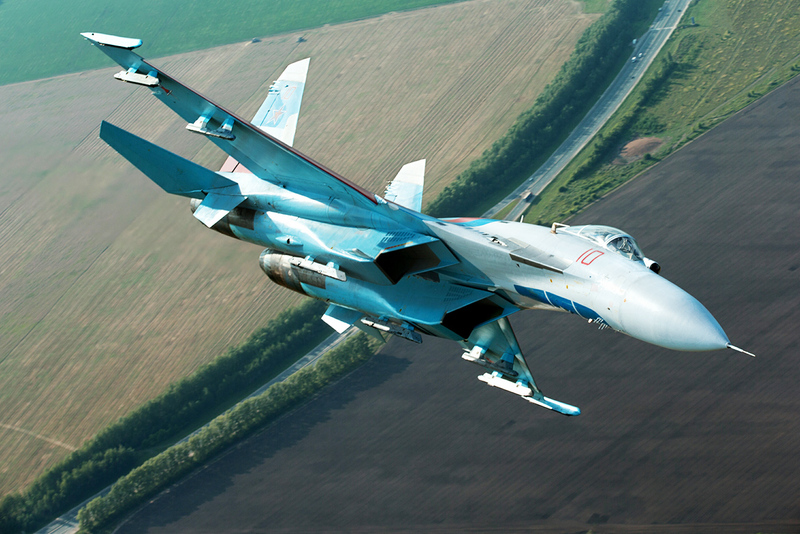 "The reason was the growing number of Su-27s in operation around the world. A country's armed forces need to know a potential enemy's weak and strong points." Safonov says that Su-27s are currently used by the air forces of Russia, India, Malaysia, Venezuela, Algeria and many other countries. In fact, the aircraft bought by the USA were not combat-capable: They had been disarmed. The USAF made headlines last fall, when Canadian journalist Christian Borys uploaded to Twitter photographs of F/A-18 fighters in the camouflage scheme normally applied to Russian Air Force Su-34 bombers. "The difference between the two types is that the F/A-18 has a folding wing and vertical twin stabilizers: The Su-34's stabilizers are parallel," Vadim Kozyulin, a professor at Moscow's Military Science Academy, told RBTH. "If filmed from the ground with amateur equipment, the two types will be impossible to tell apart. In fact, this may have been the case in Nevada in November 2016." Kozyulin added that repainting aircraft is normal practice in the USAF: It is used for friend-or-foe training purposes. Igor Korotchenko, editor-in-chief of National Defense magazine, disagrees: "Conspiracy theories have nothing to do with this. In real combat, visual camouflage is useless against both Russian and foreign radars, which identify the aircraft type by its signature." In the past, private U.S. arms dealers only sold Soviet and Russian-made small arms. Now Soviet tanks have become available. Why does the U.S. need Russian military digital cameras? The National Interest reports that a disarmed Russian T-72 tank that cannot be used for combat but is otherwise fully equipped can be bought for $50,000. However, the customer will only receive the military ironclad after obtaining the necessary clearances from U.S. authorities. Most of this Soviet surplus comes from Eastern Europe, which has inherited a generous stockpile of armor and other weapons systems from the Cold War era. The National Interest says that private firms buy written-off tanks at discount prices, ship them to the U.S., saw off the gun barrels and customize each vehicle to meet client requirements. It normally takes around two months between ordering a tank and having it delivered. The key companies selling such kit include Redfish and Century Arms. Apart from tanks and small arms, they also offer different types of Soviet-made armored personnel carriers and off-road vehicles.